The niche real estate business of buying first position seller held notes at a discount is on the verge of exploding wide open once again. 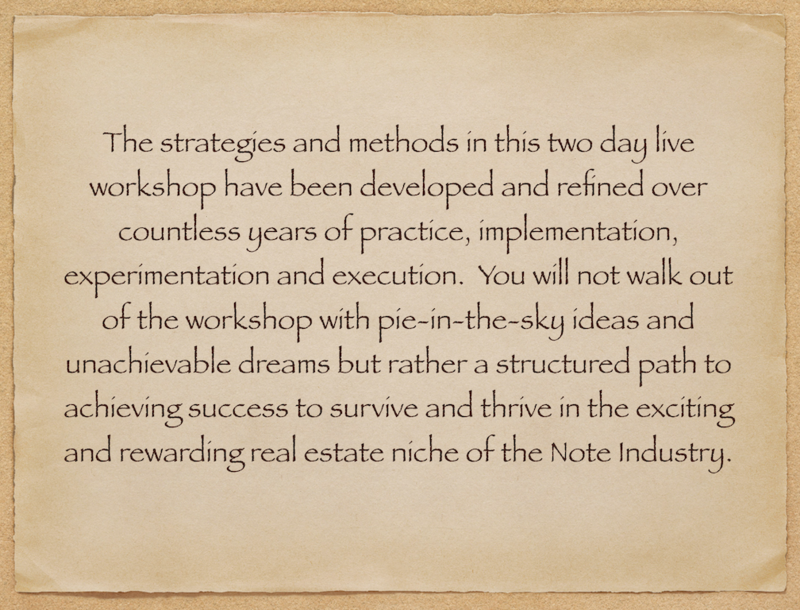 Whether you are new to the note industry, have been a note broker for awhile or are an experienced note broker and note buyer this workshop will take you to the next level. 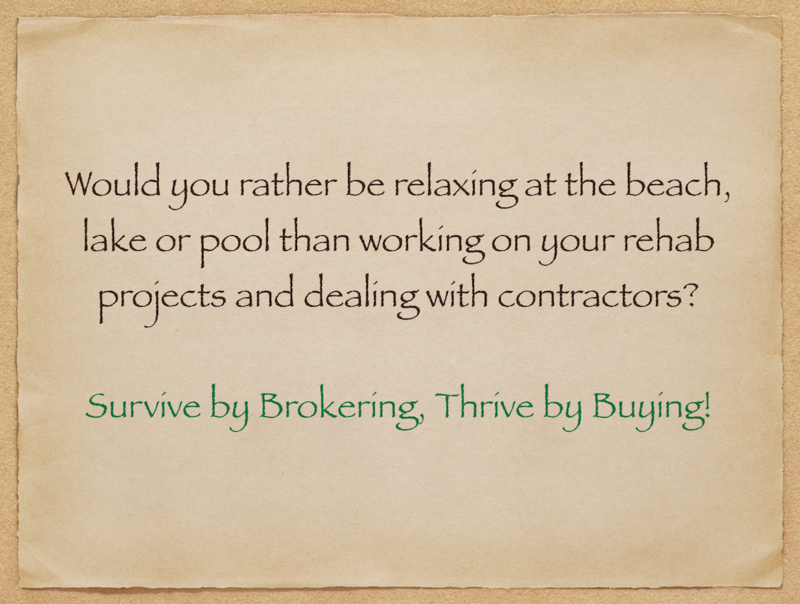 We can survive and make a good living just brokering notes but we can thrive by starting to or continuing to buy notes for ourselves. Times have changed yet again and you have to change with them before it is too late. Because you are doing the same old things the same old way you always have - tentatively, timidly, hoping that this time it's going to work - you are paving your road to failure. This is a must attend workshop for ANYONE in the real estate business, especially in today's market. You may have tried a thing or two but you have not spent the time to completely test it for yourself. I've done the testing and I have the results. 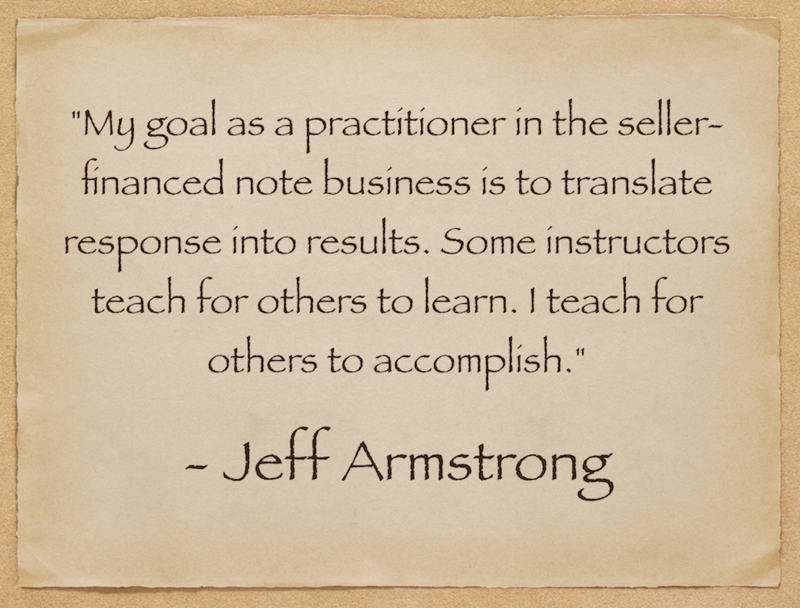 Learn what works TODAY from a current practitioner in the note business! 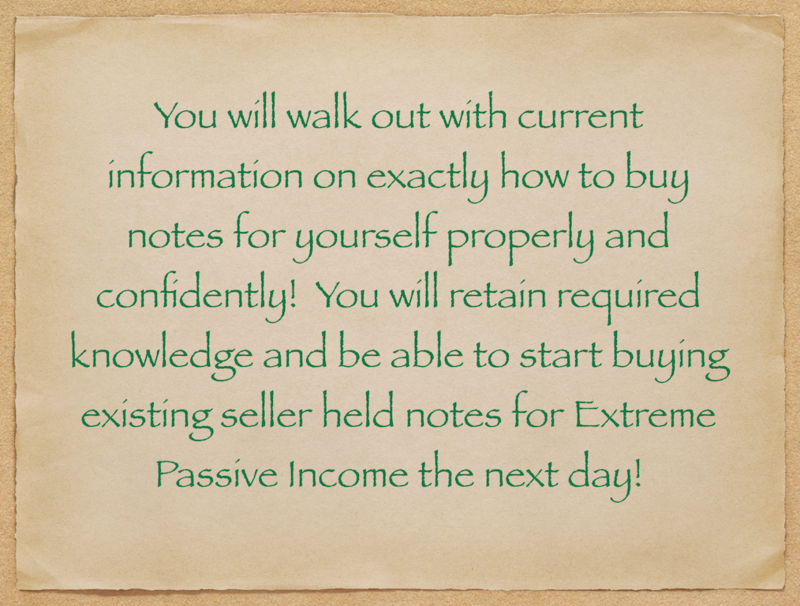 Learn genuine, practical, up to date and detailed information about today's note business and how to take advantage of it. Over the last several months we have seen a marked and steady increase in not only the numbers of note holders contacting us but also in the number of note holders that are accepting our prices. Will you be getting your share? OR will you wait until the wave has already crested and try to jump on the bandwagon at the last minute? On Saturday and Sunday, September 25 and 26th you will attend the real estate workshop of the year that will take you to the next level of advanced note brokering and investing in notes for yourself. 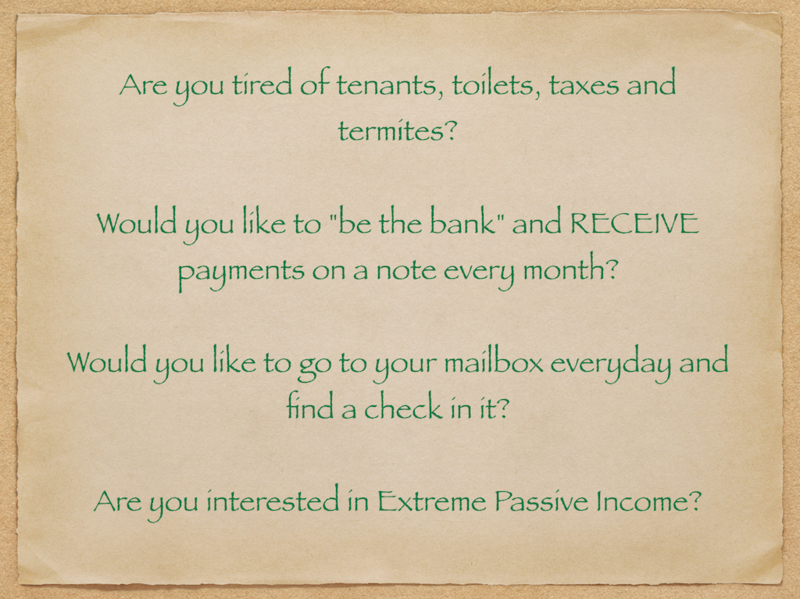 You will receive the specific details on how to reap the rewards of the upcoming wave in the seller held note industry. For new or experienced real estate investors and real estate professionals this is a must attend event. Selling a property in today’s current uncertain market is a major concern for investors, homeowners and individual property owners. I was recently reading on the internet the other day that Zillow.com reported a drop in home values alone of over $2 Trillion in value. Less than 2 years ago 1 in 400 real estate transactions were seller financed. Today they are predicting 1 in 50 real estate transactions to be seller financed, and I personally think that number is low! In short, there will be more seller held notes out there for us in the note business to go after, which means more opportunity. This year in the seller financed note business we are looking forward to and have already seen an increase in both volume and closed transactions. In my 19 years in the note business I have never seen anything like this market, it is the perfect storm brewing and you can learn how to take advantage of it. Will you be getting your share? At the next SOP 301 workshop you learn from an actual current practitioner in the business of where our deals are coming from and how they are purchased. Don’t wait on the sidelines until it’s too late. Join us in Los Angeles as we dive into the reality of the note business and what is working today. Not Sure If This Workshop Is For You? This workshop is for people who want to get deeper into the seller held note business, individuals who already have some exposure to the business and want to take it up a notch, people who have been dabbling in the business for a little while and are now ready to get serious and buy a note for themselves, individuals who were in the business in the past but want to get back into it now or who are experienced note brokers and buyers that want to learn the latest due diligence methods. It is also for real estate agents, real estate brokers and mortgage professionals who are not doing as well as they were a couple years ago, who want to add something to their business to keep the cash flow coming in and who want to learn how seller held notes can help them sell more properties in the current market. If you have any questions or you are on the fence wondering if this workshop is for you or not, please give me a call at 800-845-3055. The Secrets of Paper 301 Workshop will be limited to 30 people, sign up NOW to reserve your spot! The workshop includes a class workbook, all handouts and extras PLUS lunch every day. The content is fresh, current and real. As usual with all of Jeff's events there are absolutely NO up-sells. Just pure, up to date, genuine information, existing tactics and inner workings of the note business. After the workshop is over you will have Jeff's support as long as needed.